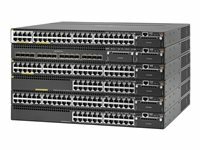 The Aruba 3810 Switch Series provides performance and resiliency for enterprises, SMBs, and branch office networks. With HPE Smart Rate multi-gigabit ports for high-speed 802.11ac devices, this advanced Layer 3 switch delivers a better application experience with low latency, virtualisation with resilient stacking technology, and line rate 40GbE for plenty of back haul capacity. The Aruba 3810 is easy to deploy and manage with advanced security and network management tools like Aruba ClearPass Policy Manager, Aruba AirWave and cloud-based Aruba Central. Scalable high-end campus access switch with 24x Gigabit ports and an open module slot for more high speed connections. This model has 24x 10/100/1000 ports together with 1x open module slots and a stacking module slot. Power supplies are ordered separately. The Aruba 3810 Switch Series is designed with a ProVision ASIC designed to enable the mobile campus with very low latency, increased packet buffering, and adaptive power consumption. The Aruba 3810 Switch Series includes robust security and quality of services features to build a mobile campus network that meets corporate policies and compliance requirements. The Aruba 3810 Switch Series supports Aruba ClearPass Policy Manager to provide unified and consistent policy between wired and wireless users. Simplified implementation and management of guest login, user onboarding, network access, security, QoS, and other network policies on the network. Performance and Power for the Digital Workplace The Aruba 3810 Switch Series is an industry leading mobile campus access solution for enterprises, SMBs, and branch office networks. With HPE Smart Rate multi-gigabit ports for high speed 802.11ac devices, the Aruba 3810 will prepare your network for tomorrow. Advanced Layer 2 and 3 feature set with OSPF, IPv6, IPv4 BGP, robust QoS and policy-based routing are included with no software licensing. Built-in programmable and easy to use REST API interface provides configuration automation for Mobile-first campus networks. Resiliency and High Availability You Can Depend On The Aruba 3810 Switch Series is designed with a ProVision ASIC designed to enable the mobile campus with very low latency, increased packet buffering, and adaptive power consumption. Backplane stacking technology delivers high-performance stacking with up to 336 Gb/s of stacking throughput and increased resiliency. Up to ten Aruba 3810 switches can be stacked in a ring topology or up to five can be stacking in a mesh topology. Dual hot-swappable power supplies provide power and allow swapping of modules on the fly to reduce impact on the network availability. More performance with selectable queue configurations and associated memory buffering that best meets requirements of prioritised network applications. Uninterrupted switching and routing for improved application experience and enhanced L3 availability. Supports virtual router redundancy protocol (VRRP) allowing groups of two routers to dynamically back each other up to create highly available router environments in both IPv4 and IPv6 networks. Trusted Security with Unmatched Quality of Service The Aruba 3810 Switch Series includes robust security and quality of services features to build a mobile campus network that meets corporate policies and compliance requirements. Flexible traffic controls, such as policy-based routing, QoS, and ACLs, to manage end-to-end application priorities for improved user experience. Enhanced security and policy-driven application authentication with concurrent 802.1X, MAC and Web Authentication modes. Prevent unwanted traffic with advanced distributed denial of service (DDOS) protection, such as DHCP Snooping, IP Source Guard, and ARP Protection. Powerful multilevel-access security controls, such as role-based management, configurable password complexity, RADIUS/TACACS+, and SSH for improved security and control change management access. Tunneled Node to transport network traffic on a per-port basis to Aruba controller with authentication and network policies applied and enforced at the controller. Industry standard MACsec provides switch-to-switch link level security. Simplify with Unified Management The Aruba 3810 Switch Series supports Aruba ClearPass Policy Manager to provide unified and consistent policy between wired and wireless users. Simplified implementation and management of guest login, user onboarding, network access, security, QoS, and other network policies on the network. Supports Aruba AirWave and cloud-based Aruba Central to provide common platform for zero-touch provisioning, management, and monitoring for wired and wireless network devices. Scalable high-end campus access switch with 48x Gigabit ports and an open module slot for more high speed connections. Ideal for high density Gig connections. This model has 48x 10/100/1000 ports together with 1x open module slots and a stacking module slot. Power supplies are ordered separately. Expandable high-end campus access switch with 24x Gigabit PoE+ ports and an open module slot for more high speed connections. This model has 24x 10/100/1000 PoE+ ports together with 1x open module slots and a stacking module slot. Power supplies are ordered separately. When matched with the correct dual power supplies, supports up to 840W of PoE+ power across 48 ports. This model has 48x 10/100/1000 PoE+ ports together with 1x open module slots and a stacking module slot. Power supplies are ordered separately. When matched with the correct dual power supplies, supports up to 1440W of PoE+ power across 48 ports. 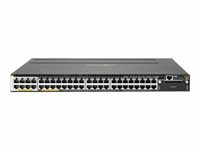 The Aruba 3810 Switch Series provides performance and resiliency for enterprises, SMBs, and branch office networks. With HPE Smart Rate multi-gigabit ports for high-speed 802.11ac devices, this advanced Layer 3 switch delivers a better application experience with low latency, virtualisation with resilient stacking technology, and line rate 40GbE for plenty of back haul capacity. The Aruba 3810 is easy to deploy and manage with advanced security and netScalable high-end campus access switch with 16x SFP+ ports and two open module slots for more high speed connections. Ideal for high density 10G fibre connections.. This model has 16x 1000/10000 SFP+ ports together with 2x open module slots and a stacking module slot. Power supplies ordered separately. 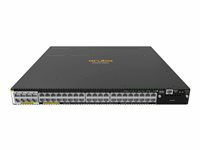 The Aruba 3810 Switch Series provides performance and resiliency for enterprises, SMBs, and branch office networks. With HPE Smart Rate multi-gigabit ports for high-speed 802.11ac devices, this advanced Layer 3 switch delivers a better application experience with low latency, virtualization with resilient stacking technology, and line rate 40GbE for plenty of back haul capacity. The Aruba 3810 is easy to deploy and manage with advanced security and network management tools like Aruba ClearPass Policy Manager, Aruba AirWave and cloud-based Aruba Central. Features: The Aruba 3810 Switch Series is an industry leading mobile campus access solution for enterprises, SMBs, and branch office networks. With HPE Smart Rate multi-gigabit ports for high speed 802.11ac devices, the Aruba 3810 will prepare your network for tomorrow. The Aruba 3810 Switch Series is designed with a ProVision ASIC designed to enable the mobile campus with very low latency, increased packet buffering, and adaptive power consumption. The Aruba 3810 Switch Series includes robust security and quality of services features to build a mobile campus network that meets corporate policies and compliance requirements. Performance and Power for the Digital Workplace The Aruba 3810 Switch Series is an industry leading mobile campus access solution for enterprises, SMBs, and branch office networks. With HPE Smart Rate multi-gigabit ports for high speed 802.11ac devices, the Aruba 3810 will prepare your network for tomorrow.HPE Smart Rate ports support multi-gigabit Ethernet speeds (1, 2.5, 5, and 10 gigabit Ethernet) on existing cabling for cost-effective and convenient network upgrades with no rip and replace of cabling.Optimized for the digital workplace with unified management and security tools such as Aruba ClearPass Policy Manager, Aruba Airwave and Aruba Central. Provides optimal configuration automatically when connected to Aruba access points for PoE priority, VLAN configuration, and rogue AP containment.Rightsizes deployment and back haul capacity with modular 10GbE and 40GbE uplinks. Full PoE+ provisioning on 48-ports. Dual, redundant, hot-swappable power supplies and innovative backplane stacking technology delivers resiliency and scalability in a convenient 1U form factor.Advanced Layer 2 and 3 feature set with OSPF, IPv6, IPv4 BGP, robust QoS and policy-based routing are included with no software licensing. Built-in programmable and easy to use REST API interface provides configuration automation for Mobile-first campus networks. Resiliency and High Availability You Can Depend On The Aruba 3810 Switch Series is designed with a ProVision ASIC designed to enable the mobile campus with very low latency, increased packet buffering, and adaptive power consumption.Backplane stacking technology delivers high-performance stacking with up to 336 Gb/s of stacking throughput and increased resiliency. Up to ten Aruba 3810 switches can be stacked in a ring topology or up to five can be stacking in a mesh topology.Dual hot-swappable power supplies provide power and allow swapping of modules on the fly to reduce impact on the network availability. More performance with selectable queue configurations and associated memory buffering that best meets requirements of prioritized network applications.Selectable queue configurations enables increased performance by selecting the number of queues and associated memory buffering that best meet the requirements of the network applications.Uninterrupted switching and routing for improved application experience and enhanced L3 availability. Supports virtual router redundancy protocol (VRRP) allowing groups of two routers to dynamically back each other up to create highly available router environments in both IPv4 and IPv6 networks. Trusted Security with Unmatched Quality of Service The Aruba 3810 Switch Series includes robust security and quality of services features to build a mobile campus network that meets corporate policies and compliance requirements.Flexible traffic controls, such as policy-based routing, QoS, and ACLs, to manage end-to-end application priorities for improved user experience.Enhanced security and policy-driven application authentication with concurrent 802.1X, MAC and Web Authentication modes. Prevent unwanted traffic with advanced distributed denial of service (DDOS) protection, such as DHCP Snooping, IP Source Guard, and ARP Protection.Powerful multilevel-access security controls, such as role-based management, configurable password complexity, RADIUS/TACACS+, and SSH for improved security and control change management access.Tunneled Node to transport network traffic on a per-port basis to Aruba controller with authentication and network policies applied and enforced at the controller. Industry standard MACsec provides switch-to-switch link level security. Simplify with Unified Management The Aruba 3810 Switch Series supports Aruba ClearPass Policy Manager to provide unified and consistent policy between wired and wireless users. Simplified implementation and management of guest login, user onboarding, network access, security, QoS, and other network policies on the network.Supports Aruba AirWave and cloud-based Aruba Central to provide common platform for zero-touch provisioning, management, and monitoring for wired and wireless network devices.Supports both cloud-based Central and on-premise AirWave with the same hardware ensuring change of management platform without ripping and replacing switching infrastructure.RMON, XRMON and sFlow provide advanced monitoring and reporting capabilities for statistics, history, alarms and events.Out-of-band Ethernet management port keeps management traffic segmented from your network data traffic. 802.11ac-ready wired network Multi-gigabit Ethernet with PoE+ for high speed 802.11ac APs using existing cabling. Power and performance ProVision ASIC delivers more scalability, low latency and wire speed 40GbE. Software-defined networking The Aruba 3810 with industry standard OpenFlow, is ready for SDN applications such as HPE Network Visualizer, Optimizer, and Protector.